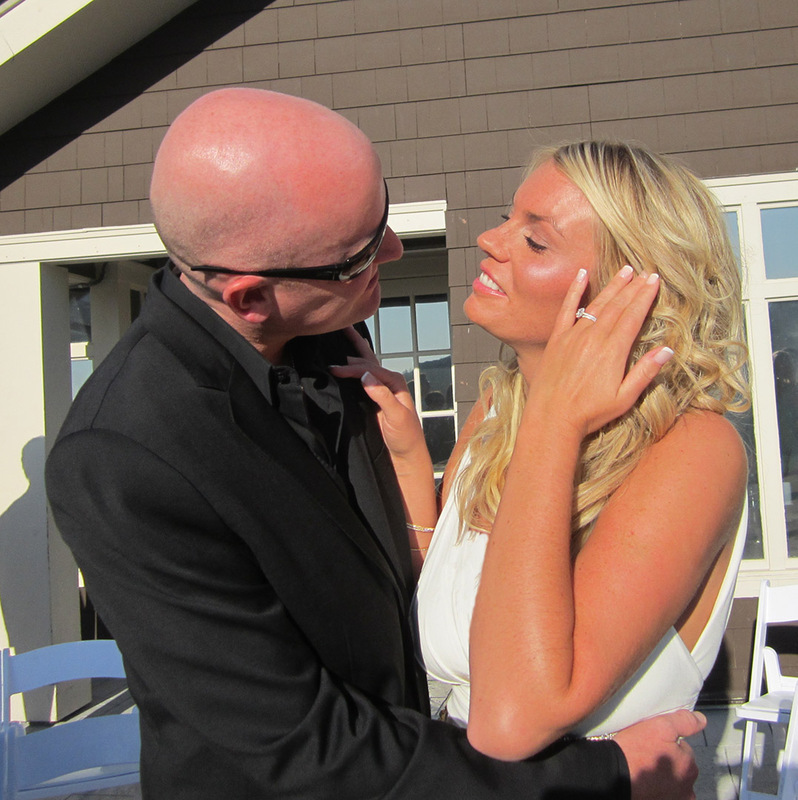 These are my favorite moments at a wedding. .. the “Behind the Scenes” glimpses, after the formal photos have been documented and before the properness of the ritual begins. 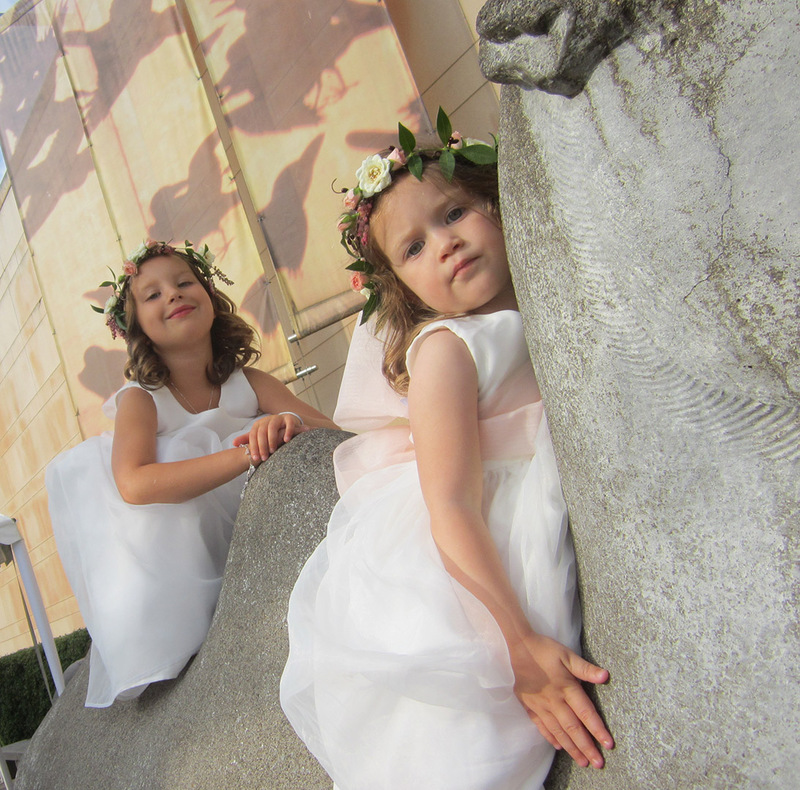 Here are our two flower girls climbing the life-size camels that protect the entrance to the Asian Art Museum. With no worry about snagging their dresses or where they may have left their shoes! It just makes me smile. So many folks in the wedding industry know Patty and Marcia as the FUN owners of Countryside Floral and Garden in Issaquah. These fabulous ladies have been together for 33 years! The theme for their wedding was so appropriate: “AT LAST”. Over 100 people came to their park-like garden to help them celebrate! And an IDEAL day it was. 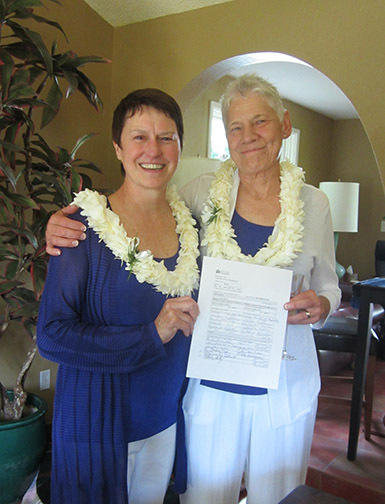 Marcia and Patty’s garden was abundantly colorful, their family and friends were ecstatic to be included in this over-the-moon, joyful celebration and the weather was PERFECT! The talented “flower sculptors” at Countryside Floral outdid themselves with lavish displays of Hawaiian foliage in gigantic baskets. I was able to stay and visit with the NEW owner of Countryside Floral and Garden (the wonderful and talented) Jon Robert Throne. Who did, indeed, send me an amazing bouquet the following day. Thank you, Darling! If I had to come up with one word for their wedding it would be: EASY! By very clear intention, Margaret and David created a joyful and relaxed day, without heavy schedules or complex structure. And it showed! 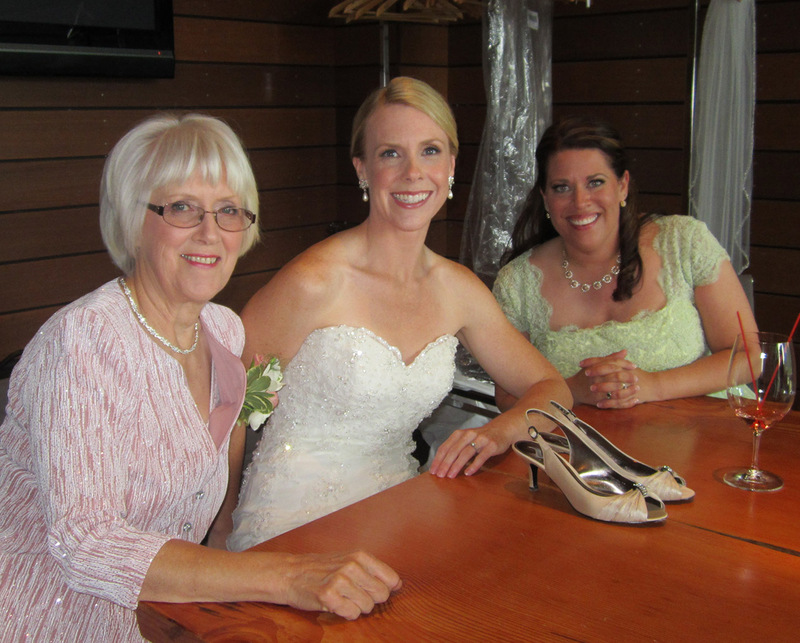 Here is Bride Margaret, with her Mama and MOH, just hanging out before the wedding (at Januik Winery). Ahhhhhhh! 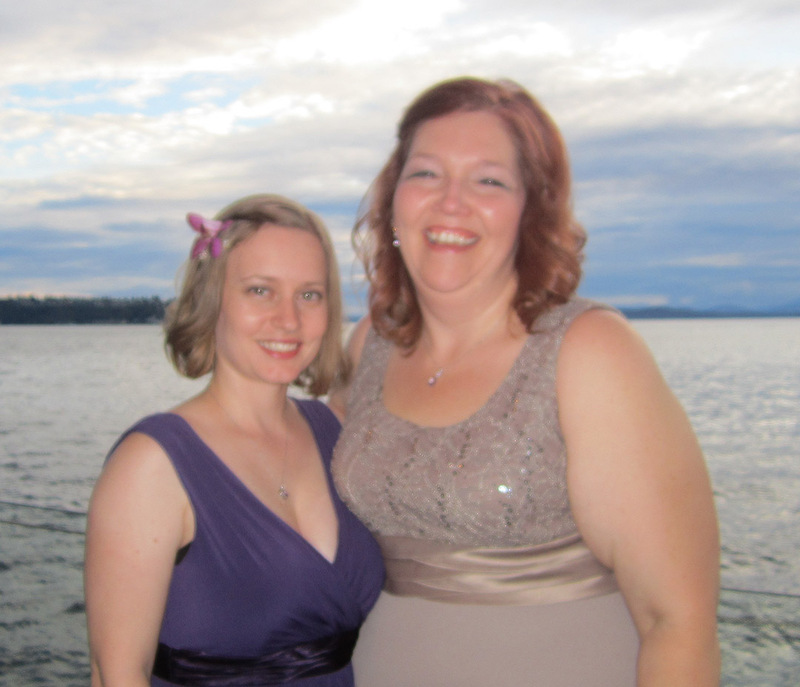 It all came together at the Salish Lodge! Aaron did finally “spill the beans” about the SURPRISE WEDDING (that he had been planning for sometime). Jessika rallied for the occasion with amazing spontaneity. Bravo! It was an ideal day at the rustic and picturesque Salish Lodge! Good luck to Aaron as he transitions into the Seattle Police Department! Christiane of Flora Nova Floral and Event Design, is so skilled. When I walk into a room that she has graced, there is always a sense of harmony and balance. 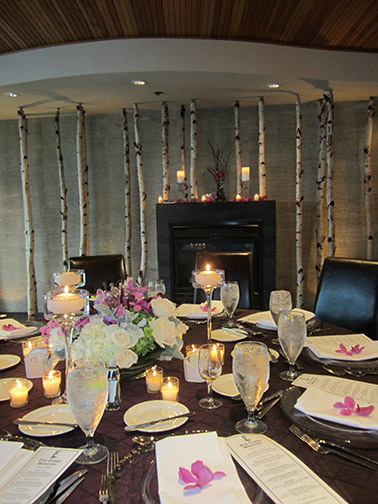 This is the Forest Room at the Edgewater Hotel, an intimate “Best Kept Secret” private dining sanctuary. Christiane’s sense of style is magic – from the charger plates, to the vases, from the grand arrangements against the large view windows to the smaller (in scale) treatment over the fireplace. Fresh and oh – so – summery! We imported these amazing ladies from Arizona! The great thing about Washington State Passing Referendum 74 is that I get to meet so many wonderful people! We were quite spoiled at the Edgewater Hotel (in the elegant Forest Room). Catie and Kathy’s nearest and dearest traveled to Seattle as well. While here, this couple took advantage of the Seattle waterfront and went on a ferris wheel ride on the day of their wedding! I joined our small group (apres ceremony) for dinner. Thank you Catie and Kathy – it was so much fun working (and playing) with you!!! 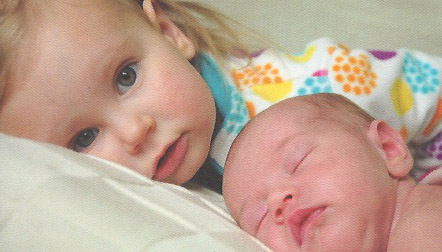 This is Big Sister Audrey with Little Sis Savannah. So happy for you ALL!